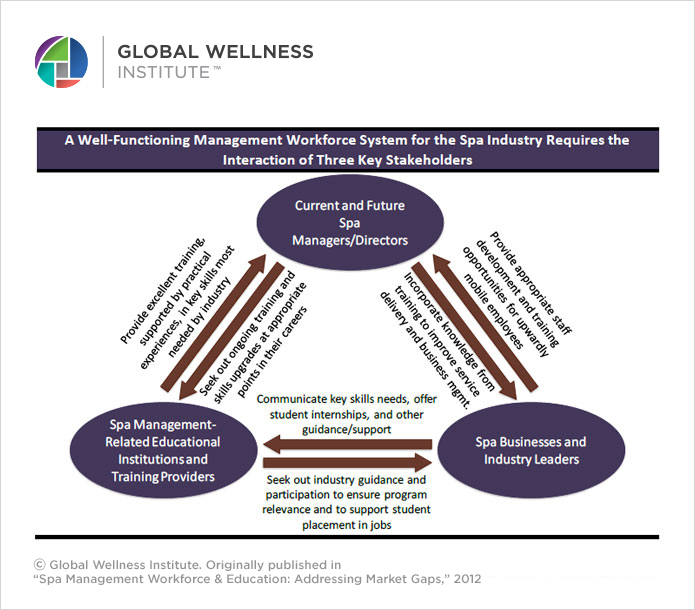 The Global Wellness Institute (GWI) is recognized as the leading source for authoritative wellness industry research. 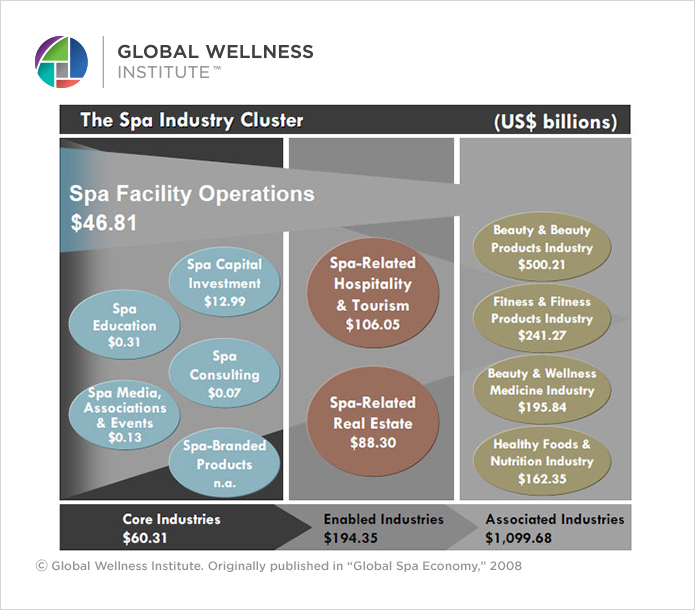 Since 2007, the GWI has commissioned and published numerous research reports, including the new study on the $4.2 trillion global wellness economy. All reports are available free to the public. 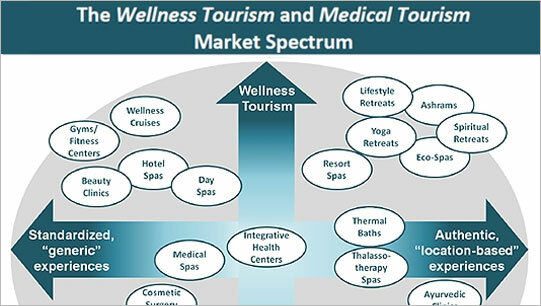 Key data from 2018 studies is below, along with charts, topline industry figures and important definitions of wellness, wellness tourism and spa. To download all GWI research, including special reports for certain geographic areas, visit Industry Research. 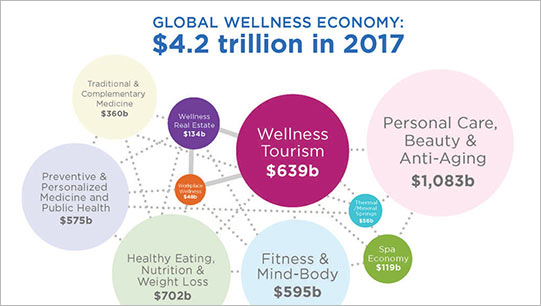 Updated data and trends are provided in the 2018 Global Wellness Economy Monitor. 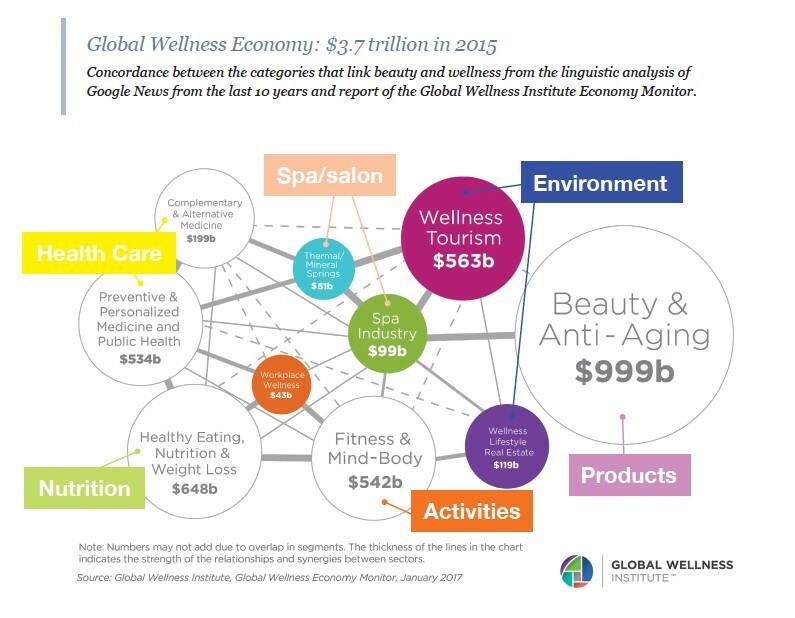 The global wellness economy is a $4.2 trillion market. 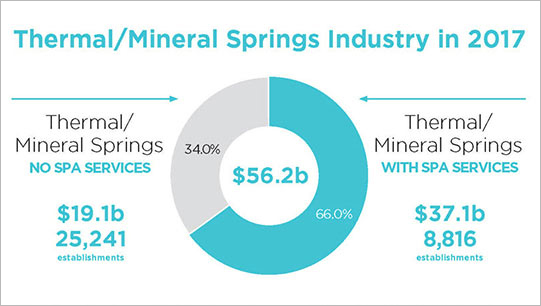 The industry grew 12.8% from 2015–2017, from a $3.7 trillion to a $4.2 trillion market, nearly twice as fast as global economic growth (3.6%). 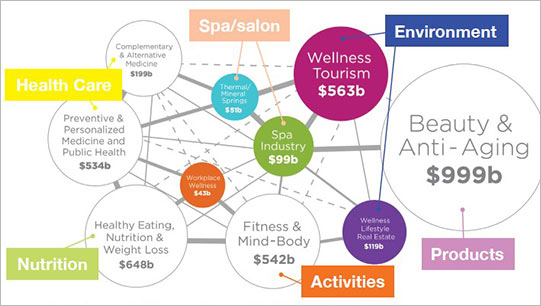 Wellness expenditures ($4.2 trillion) are more than half as large as total global health expenditures ($7.3 trillion). 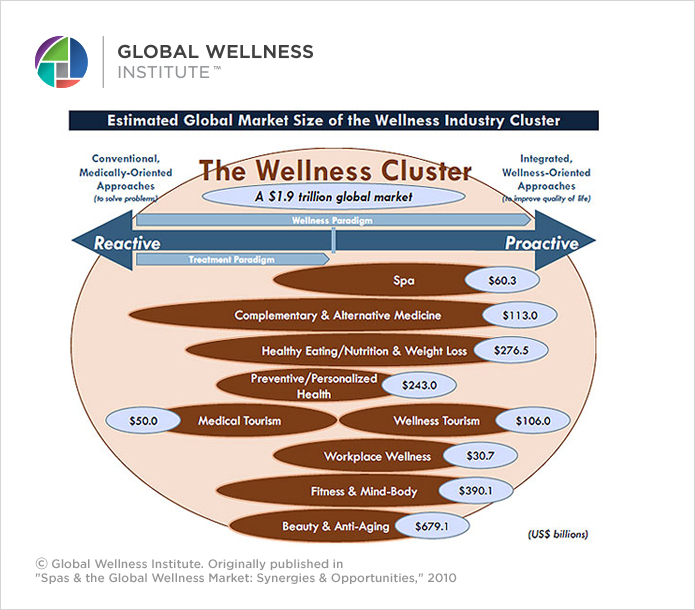 The wellness industry represents 5.3% of global economic output. 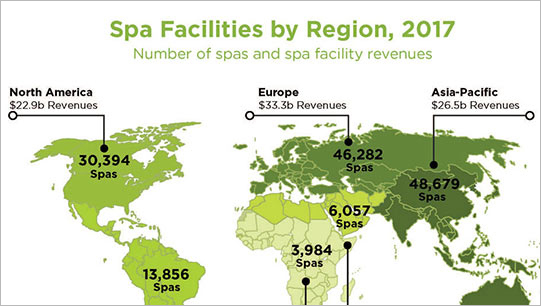 Among the 10 wellness markets analyzed, revenue growth leaders from 2015–2017 (per annum) were the spa industry (9.8%), wellness tourism (6.5%) and wellness real estate (6.4%). 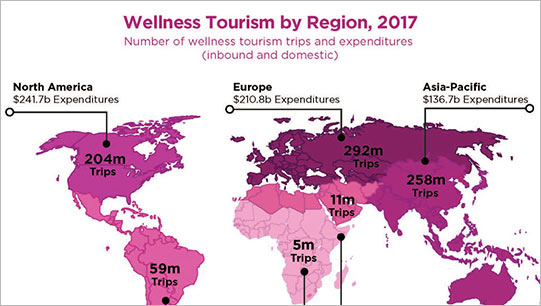 Access the latest wellness tourism data and trends in the 2018 Global Wellness Tourism Economy report. Growth was 6.5% annually, more than twice as fast as tourism overall (3.2%). 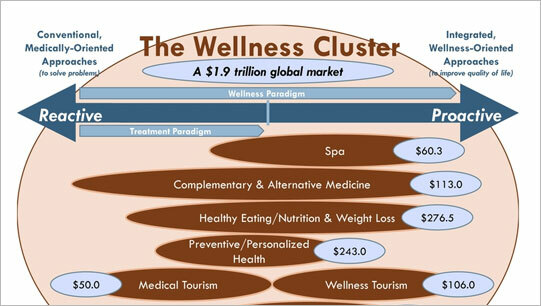 International wellness tourists on average spent $1,528 per trip, 53% more than the typical international tourist. 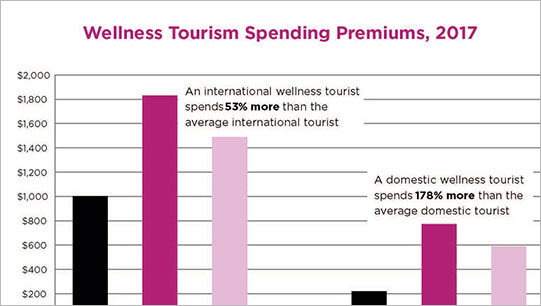 Domestic wellness tourists spend $609 per trip, 178% more than average domestic tourist. Mainstream wellness travelers account for 89% of wellness trips and 86% of expenditures. In-depth global data and key measurements are provided in the Build Well to Live Well report. 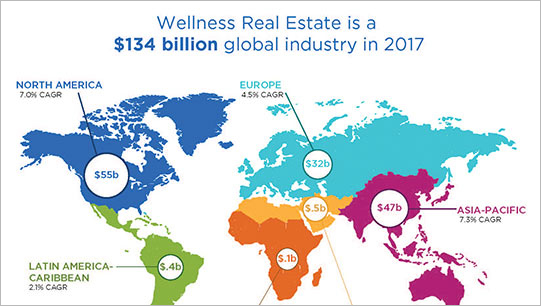 The global wellness real estate and communities sector is projected to grow from $134 to $180 billion (2017–2022). 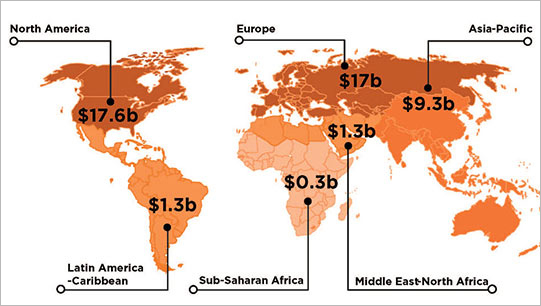 The top five markets are US ($52.5 billion), China ($19.9 billion), Australia ($9.5 billion), UK ($9 billion) and Germany ($6.4 billion). 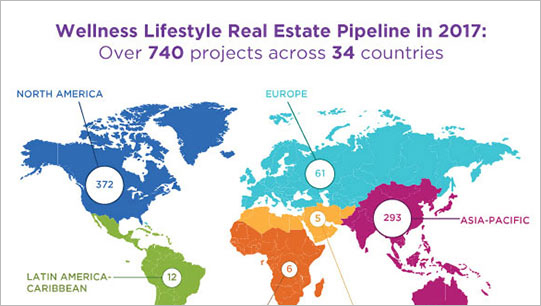 There are 740 wellness lifestyle real estate and communities built, partially built, or in development across 34 countries (1.5 million units/homes). The GWI partnered with Anjan Chatterjee, MD, FAAN, University of Pennsylvania to produce the Beauty2Wellness: Mitigating Barriers and Building Bridges report. Download the full Beauty2Wellness report here. A natural preoccupation with beauty can contribute to unfair judgments of personality and character attributes, such as intelligence and trustworthiness. People make automatic inferences about a person’s personality when they look at a face. Men are especially susceptible to adverse biases. Concepts that bridge beauty and wellness include nutrition, fitness and products. Global Wellness Institute research reports are made available to the public at no cost; download your complimentary copies here. Please note that all reports are the property of the Global Wellness Institute. Quotation of; citation from; and reference to any of the data, findings and research methodology from the report must be credited to the Global Wellness Institute. To obtain permission for copying and reproduction, please contact the Global Wellness Institute by email at info@globalwellnessinstitute.org. * Preamble to the Constitution of the WHO. ** The continuum concept is adapted from Dr. Jack Travis’s Illness Wellness Continuum. Travis was one of the pioneers of the modern wellness movement in the late 1970s. Wellness at work is the right to work in a manner that is healthy, safe, motivating and edifying. 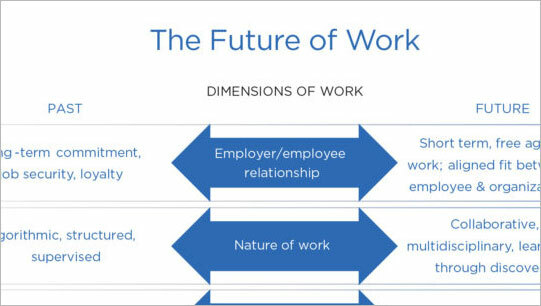 Individuals and companies are responsible for conducting work in a way that improves wellness and the wellness of others. 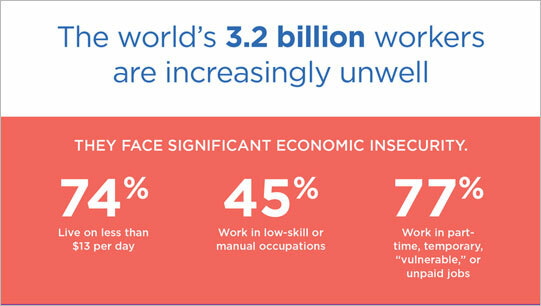 Workplace wellness is a multi-billion-dollar industry, despite the fact that only 9% of the 3 billion+ global workers have access to some type of workplace wellness program at their jobs. International Wellness Tourism Receipts: All receipts earned by a country from inbound wellness tourists, with an overnight stay. Domestic Wellness Tourism Expenditures: All expenditures in a country made by wellness tourists who are traveling within their own country of residence, with an overnight stay. 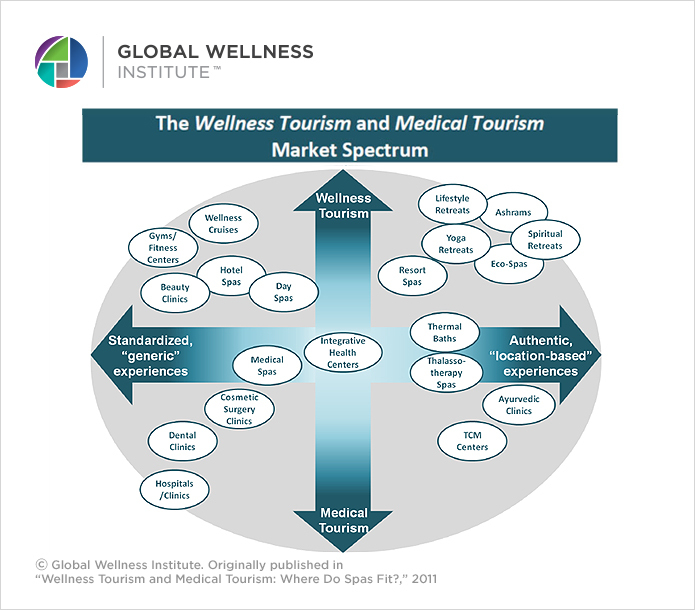 Primary Wellness Tourists: Wellness is the sole purpose or motivating factor for the trip or destination choice. These tourists account for 13% of wellness tourism trips and 16% of expenditures. Secondary Wellness Tourists: Seek to maintain their wellness or participate in wellness experiences while taking any kind of trip. 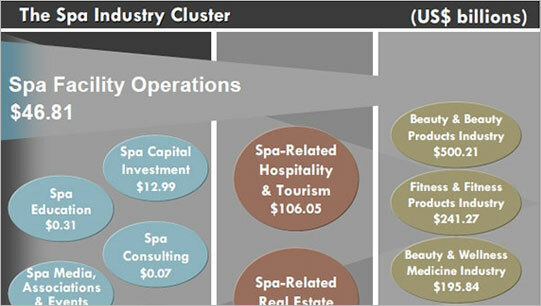 These tourists account for the significant majority of wellness tourism trips (89%) and expenditures (86%). Spas are defined as establishments that promote wellness through the provision of therapeutic and other professional services aimed at renewing the body, mind, and spirit. Most consumers and industry experts would agree that at its core—no matter its size, form or business model—a spa is an establishment that focuses on wellness. The concepts of wellness, the healing traditions drawn upon, and the therapeutic techniques applied differ dramatically across both nations and types of spas.